I have recently started playing around with my yarn collection again. Though I am now in Texas and have no need for things that are soft and fuzzy and warm, I still enjoy making the occasional scarf or hat on the Knifty Knitter Loom set. Since I really don’t need to make hat’s for my kids for the winter this year, I decided to experiment and see what else I can do with my loom set. Oh sure, look down on me for using a loom instead of needles, if that is what they are called lol, don’t look too far down you’re nose at me. I have tried to learn to knit but I have one little drawback, I am left handed and everyone I know that can knit the traditional way has tried to teach me, the cross hand south paw seems to confuse everyone and frustrate them. I tried learning from books, it’s just incredibly difficult to learn that way for this south paw, however I have accepted that and found The Loom, which I love! Though I enjoy making hats and scarves, my true love is making weird creatures so I decided to experiment. I started on a round loom and I successfully made a ball. Woo hoo ! 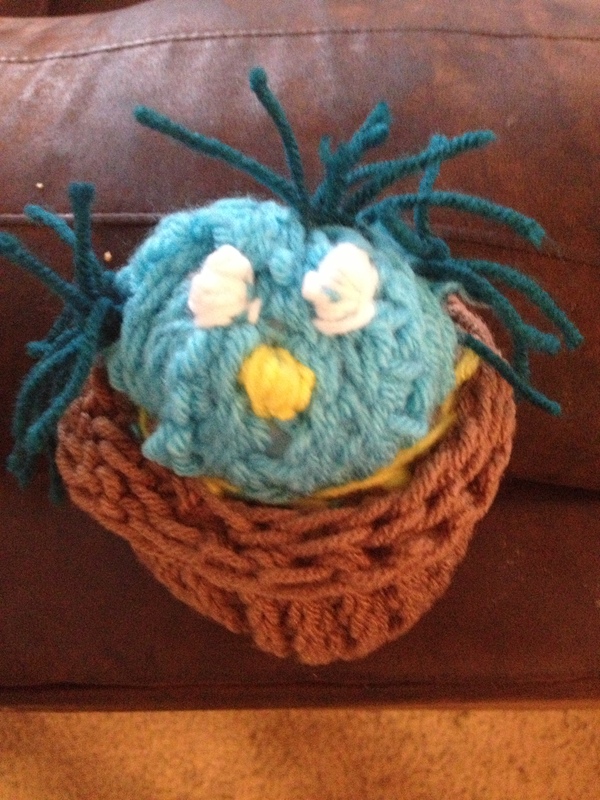 It needed something else however so as I was making a brown ball, I took a break and my daughter took the first blue ball and put it inside the loom with the half of the brown ball finished, and out of the mouths of babes she replied ” mom, this looks like a nest with a egg in it”. She was right! So, that’s what I made. I finished off the “nest and attached the “egg” inside it. Looking great so far! Usually I use buttons for eyes, however those are not safe for babies (or cats) so I decided to attempt to stitch with yarn a face and since I decided to turn it into a cat toy (no cat can walk away from yarn, right?} I wanted to add some dangling yarn was feathers and this is what came out. Wow! Ugly as heck! 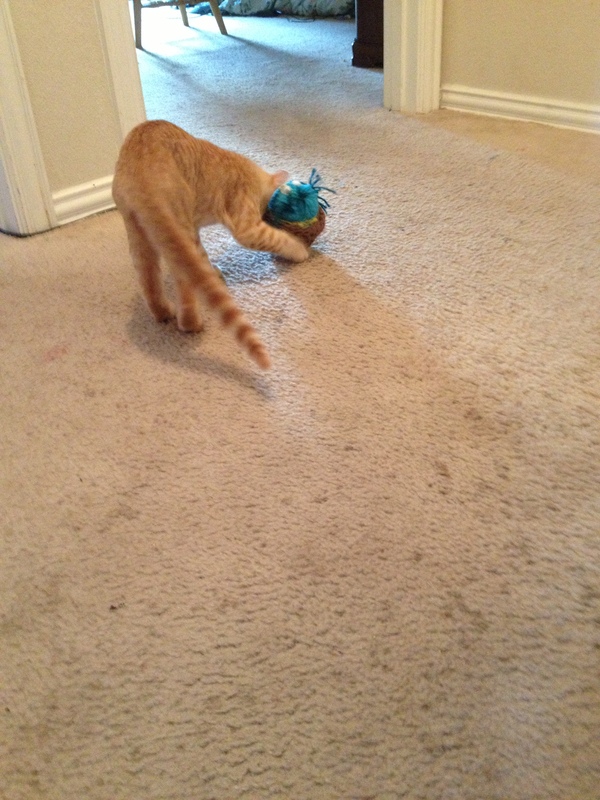 When I first gave it to my cat to see if he would play with it, he just laid down with it and started “cleaning it”. Well, it did smell funny, my yarn has been sitting in the garage for 2 years, so I threw it in the washer and dryer. When it was finished, and still intact ( I always like to test the convenient washing method on anything I make) and smelled like my favorite blanket, I gave it to him again. Simba played with it for about a minute, got bored and it’s been laying on the floor every since. So much for a cat toy. Every once in a while my kids will pick it up an throw it at each other but that’s about it. For my next yarn experiment, WHITE YARN SNOW BALLS!!! We are from Idaho and we really miss the snow, so tomorrow, I will experiment and see if I can make some “snowballs” that my kids can safely throw at each other this winter! I hope our dog doesn’t decide to make them yellow snowballs! Just remember, even things that turn out bad can be the start of something better and even if it’s not perfect in you’re eyes, doesn’t mean it won’t be perfect for someone else’s.